Once again I bring some of the websites and other things I have been checking out this past week. For those of you not in the know, the photo to the right is of Latte Art. 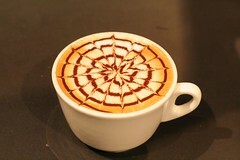 It is an interesting trend in the coffee world and requires alot of skill. This particular Latte looks Delicious. Ok I got distracted, now to my links. I hope you enjoy. This is a moving film about the drug trafficing and how it effects real people. It is amazing how stereotypes shape the world we live in. It also shows are easily people can get into the drug scene. This movie was in spanish and really helped draw us into a world we know little about. As a christian I feel movies like this help us realize the world’s need for christ and helps break assumptions that prevent us from sharing. Nothing like time magazine to tell us what is important in history. Take a look at the list. Interviews with Atomic Bomb survivors. How easily we can forget things that had such a large impact. We often hear about events that happen so often we forget the real impact. These interview a touching and remind us how events in history really effect people. Becuase I’m from a generation that did not experience this event. It reminds how important it is to remind and stress the impact things have on our lives today. Amazing how laws can become outdated as society reinterprets them. Apparently there is a law in Massachusetts that Blasphemy is worthy of Jail. Atheist beware. Should they take it off the books or keep as a reminder to see how much change has occured in society?